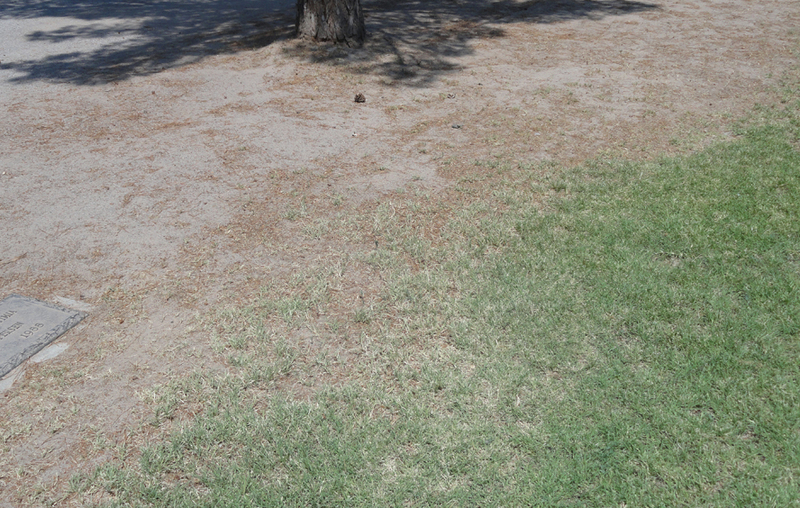 The unmarked graves of Thomas and Actea Duncan. This post could go in several directions, but the one that tops everything for me is the effect an author can have on a reader. It all began with a post I did four years ago about a distant cousin, Thomas W. Duncan who wrote a best-selling book in the 1940s. 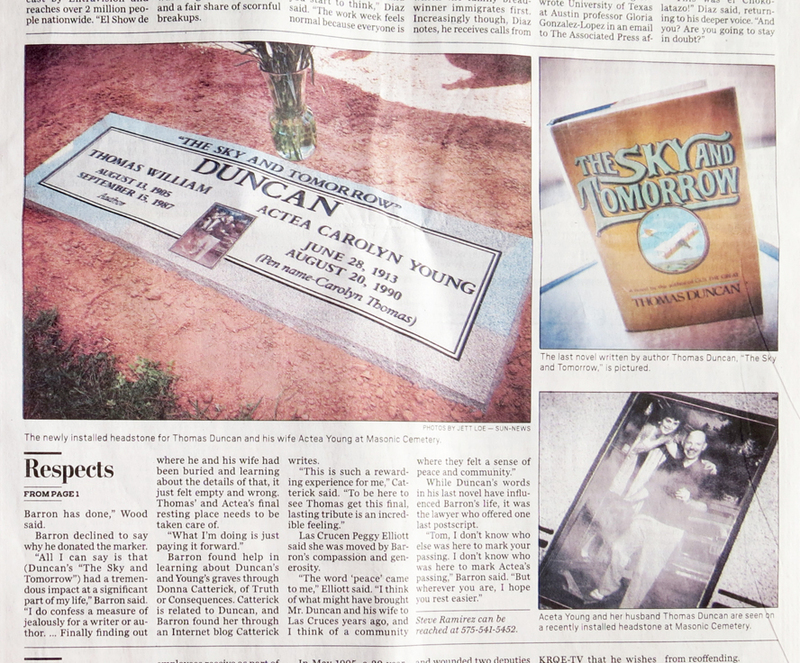 And then a follow-up story I wrote on his unmarked grave in Las Cruces, New Mexico. In the early 1980s Robert Barron, now a lawyer from Colorado Springs, Colorado, read Thomas Duncan’s last book, “The Sky and Tomorrow.” The book had a strong inspirational effect on him. Now more than 30 years later, he wanted to show his appreciation, if not to the author, perhaps to his children. He made an internet search and found my blog posts. Thwarted by learning that Thomas and his wife, Actea, had no children and then shocked that the Duncans were buried in unmarked graves, Robert shifted gears. “This is not acceptable.” And so a man who was affected by an author’s words, set out to have proper stones placed on the graves. This is man of action, determined to resolve the issue. It took several months of planning with the help of Peggy Wood, sexton at the Masonic Cemetery, to design and have the headstone set. For the unveiling Robert traveled to Las Cruces from Colorado. I met him there and we met Peggy finally after dozens of emails. 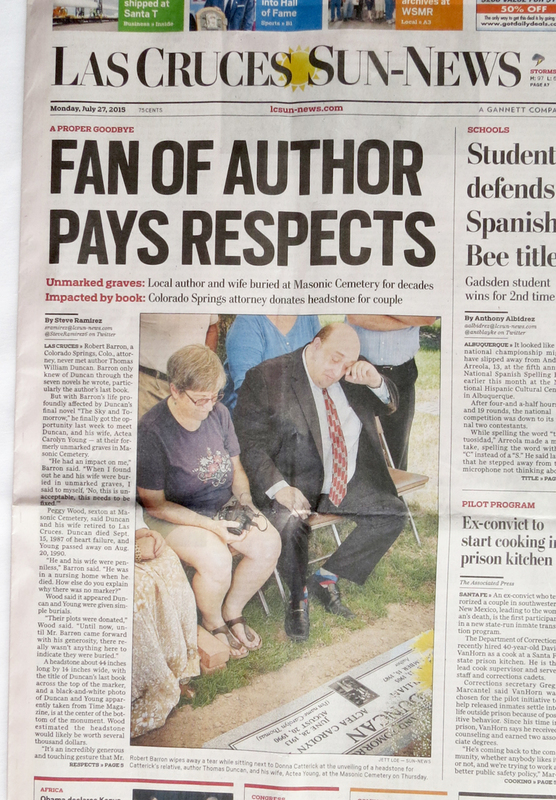 She assembled a group of book lovers, local historians, a genealogical society member, along with a local newspaper reporter, Steve Ramirez (his article here), and the paper’s photographer, Jett Loe. 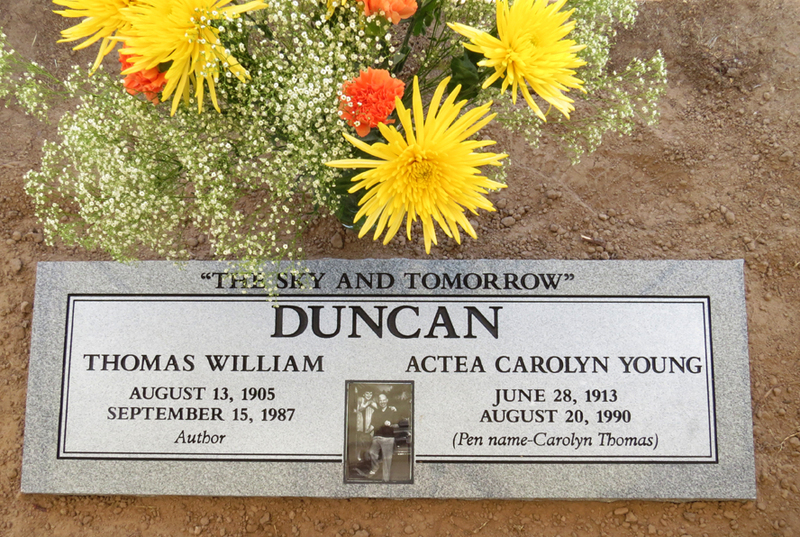 Thomas and Actea Duncan now have beautifully honored graves. I was pleasantly surprised to have so many folks there for the ceremony. Robert spoke eloquently about why he wanted the memorial placed. It was a way of thanking Tom Duncan and it was closure for Robert. The Las Cruces locals talked about early Las Cruces and perhaps why the Duncans ended up there. It was fun to hear their stories. It gave me a deeper understanding of the city – not so long ago there was very little development east of I-25. Hard to imagine that now. We left the cemetery having honored Thomas and Actea Duncan. We learned more about them and the town where they chose to live out their lives. I was able to see a man, shocked at the lack of a proper stone for the grave of someone he cared about, set about to fix that. It was inspiring to witness that resolution. All because an author, Thomas W. Duncan, wrote words that inspired a young Robert Barron. Besides the satisfaction of seeing a monument on my distant relatives’ graves, meeting Robert and the Las Cruces folks, I was struck by the power of the internet and by a blog as small as mine. It’s satisfying to have been a facilitator in Robert’s quest. This entry was posted in Genealogy and tagged actea, duncan, robert barron, thomas w. duncan, unmarked graves by Donna Catterick. Bookmark the permalink. This is so wonderful, Donna, and yes, inspirational. We really don’t know what impact our art, our words can have on another. And we never will unless we put it out there. Thank You ! After reading the story I thought that book must be special. I picked up the last hard back of The Sky and Tomorrow on Amazon. Upon reading the first page, my suspicions were confirmed. Can’t wait to finish the book. I’m fascinated by this trail of stories and books and connections. Thanks for adding to it! What a heartwarming story! Thanks for sharing it. It is amazing how everything pulled together in such a wonderful way. Pingback: The Sky and Tomorrow | Tell my story. After hearing this story, I wanted to know more about the book that changed a life. Have you read that book? It’s fascinating to me what resonates deeply with people. I did read it – it was okay. I think it has to be the right time and the right person – it is interesting.